Halloween is here and that means it's time to come up with some SPOOKY culinary creations! 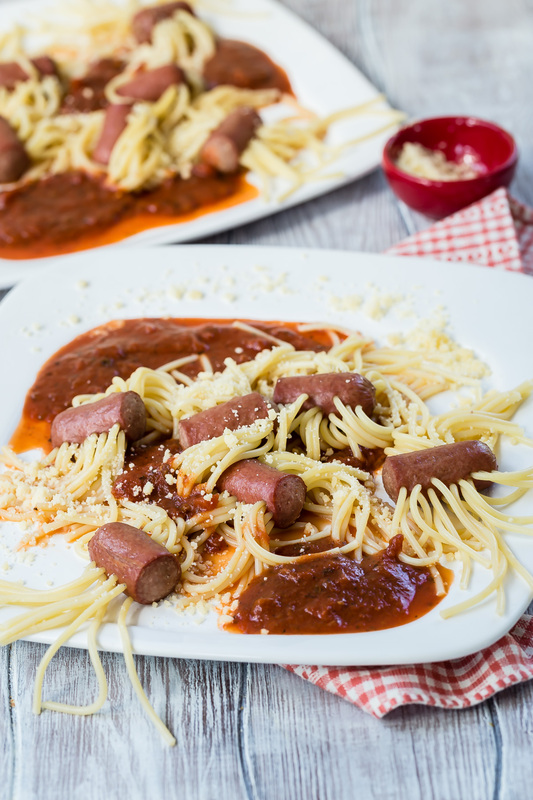 The funniest part of this recipe is that you'll have everyone guessing just how you got the "arms" and "legs" through the franks! I test drove a batch of these Freaky Franks with some of Kenya's buddies last week in advance of the holiday and the kids loved eating them. And parents can't seem to get over how creepy they look covered in "blood" (tomato sauce). 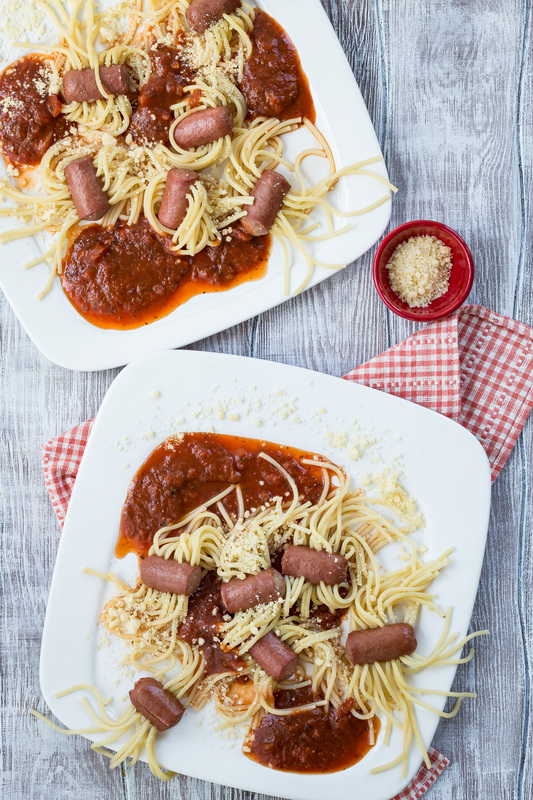 This is the perfect recipe to make WITH your kids before a long night of trick or treating. 2. Cut each hot dog link into 4 even pieces. 3. Line the spaghetti up and break in half into 4 inch pieces. 4. 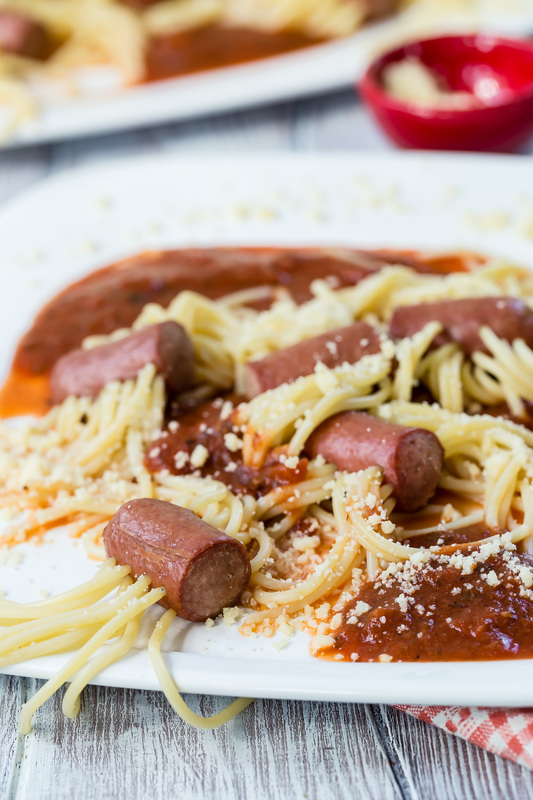 Poke the spaghetti pieces through the pieces of hot dog lengthwise. 5. Place the “Freaky Franks” in boiling water and cook for 10-11 minutes and drain. Just love them!!! Thank you! thanks for this great idea! i made this for a halloween party and it was a hit! My 5 yr old loved them and called them \"spaghetti spiders\"! Perfect for Daycare Halloween lunch! I\"m prepping it tonight. Always so many great ideas, you are my go to site and you make everything look so easy i can relax about trying something new.